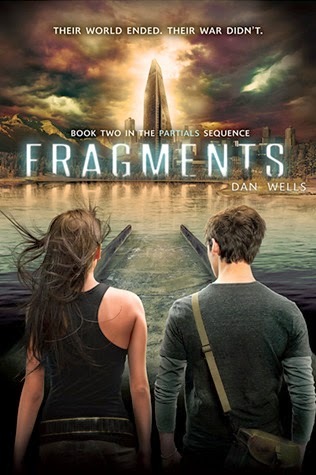 A worthy sequel to Partials, Fragments starts off a bit, well, fragmented: intentionally and skillfully so. At least three separate storylines progress on their own - Kira, Samm, and the Long Island colony - for a while before combining, intertwining, and breaking off again. Fortunately, we don't have to wonder about any of our favorite characters for very long as Wells moves us through the separate plot lines frequently. Kira is looking for any clues regarding the Trust. Picking through an abandoned New York City, she locates ParaGen's Manhattan offices, but a search reveals little except that someone else has been there in the recent past. Kira unexpectedly discovers an invaluable but unpredictable ally who has some of the answers she needs. After joining up with Samm and another somewhat friendly Partial, Heron, Kira sets off on a dangerous trek through the Midwest's toxic wasteland to reach the ParaGen headquarters in Denver. Meanwhile the humans on Long Island are being invaded by a faction of Partials led by Dr. Morgan, determined to find Kira, convinced she holds the answers to reversing the Partials' expiration date. Marcus is doing his best to track down Nandita and Ariel, one of the other girls Nandita raised with Kira, in his own bid to find answers and protect the human colony from extinction. Seriously, non-stop, toe-curling action in this one. I couldn't read fast enough to keep up with my need to know what was going to happen next. And I read pretty fast. But Wells doesn't neglect the inner turmoil of the characters either. Kira is constantly torn between her dual identities as both a human, having been raised that way, and a Partial, which she only recently discovered. She desperately insists that she will not - cannot - choose a side, that there must be a way to save everyone, until she is brought face-to-face with a very real moral dilemma to which her idealistic values do not provide an acceptable solution. The age-old question, "Does the end justify the means?" shows up in several iterations. Is finding a cure worth it if we have to violate our ethics to do so? What good does it do to keep our souls intact if it costs not only our lives, but our entire species and civilization? And is it even possible to convince people to look beyond the present and make decisions based on the future? "We're in a war," said Kira. "We're not even in a war we can win--humans and Partials are killing each other, and themselves, and everything they can get their sights on, because it's the only way they know to solve problems. 'If we don't fight, we'll die.' What we need to face is that we'll still die even if we do fight, and we don't want to face that because it's too frightening. It's easier to fall back into the same patterns of hate and retribution, because at least then we're doing something." ** As I did with the first book in this series, in the interests of full disclosure, let me mention the author Dan Wells and I were friends eons ago during our freshman year of college. I haven't spoken to him in years, though we recently became facebook friends. It's always nice to discover that someone you knew way back when has done well for him- or herself.